May 9th, June 13th and October 10th. Basically, its every second Saturdays, May - October, 10:00 a.m. to 4:00 p.m., in Welburn Square, across from the Ballston Metro station. Jewelry, pottery, photography, textiles, fashion accessories, handmade gifts and household items. Live music in the afternoon. 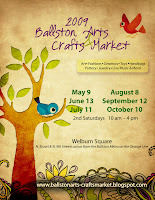 For more info, visit the Arts and Crafts Market page here. Looking forward to this fun event and hope to see you there!